1. Stunning HD 1080P with H.264 image compression format, providing you clear image and video . 2. 3 Dbi antenna. Supports cable network and Wi-Fi connection. 2. The camera only supports 2.4GHz band not 5GHz. Please close the 5GHz before connecting, if your router supports both bands. 3. The name and password of your Wi-Fi should not contain special characters such as 'and &. 4. Make sure that your Wi-Fi encryption is WPA2-PSK(AES). Step 1: Launch the iSmartViewPro app, Click + to access Add Camera page and select "Add cameras via WiFi configuration guide"
Step 2: Scan the QR code on the bottom of the camera, and name the camera. Then "Next"
Step 3: Input correct WiFi password, then "Confirm", and the camera will try to connect. It will go back to the camera page and shows "online" if adds successfully. Please tap "try again" and repeat the process for 2-4 times, if it fails to connect. The whole process should be finished within 5 minutes from power on. Otherwise, the camera should be unplugged and powered back. Free return and exchange service within 60 days and free technical assistance via email. Email us if you meet any problems. 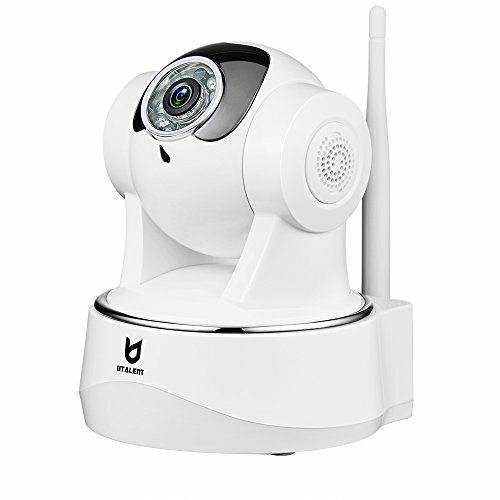 Genuine 1080P & IR Night Vision: Superb HD 1080P Video at 30fps, extremely fluent live streams and superior clarity of images providing you the ultimate visual experience. With 10 IR LEDs, night vision up to 20 feet, longer distance makes you see further and clearer. Protect your home's security day and night. Two Way Audio: Built-in speaker and microphone, you can communicate easily with your family anytime anywhere via the smart phone App. Pan Tilt & Remote: You can remotely control the camera via using the App to view your room from any angle you want. Wide viewing angle with horizontal 290 degree pan and vertical 120 degree tilt . Motion Detection & Alarm Push & Recording: Automatically detect moving objects and alarm push to your smart phone via E-mail, App and FTP. Support Onvif. Micro SD card (Built-in Micro SD Slot, Max 64 GB supported, SD card is not included) for recording, storing and reviewing. If you have any questions about this product by Utalent, contact us by completing and submitting the form below. If you are looking for a specif part number, please include it with your message.